diyLAW is happy to reproduce an article by The Incorporated Council of Law Reporting, which we found interesting and informative, and more importantly, we believe will assist all Litigants in Person. But a layperson who cannot get legal aid or insurance to cover the cost of a lawyer is not a fool – merely a victim of the new regime under LASPO (the Legal Aid, Sentencing and Punishment of Offenders Act 2012) which (no doubt by sheer coincidence) came into force on April Fool’s Day this year. Such a person, if forced into a position where they have to represent themselves in court, is generally known as a “litigant in person” (LiP). An alternative description, “self-represented litigant” (SRL) was proposed in recent years but has not found general acceptance and last month the Master of the Rolls, Lord Dyson, issued Practice Guidance clarifying the position and re-adopting the traditional LiP description. Stark warnings have been issued about the likely effects of the severe cutbacks in legal aid to which LASPO will give rise. The most obvious is a massive rise in the number of litigants in person, and it is feared that this will slow down the administration of justice as judges, court officials and lawyers for the other parties in litigation spend extra time helping them to understand the procedure they need to follow and the case they need to meet. Before they get to court, where do such litigants in person go for help in presenting their case without a lawyer to help them? Moreover, most small and medium-sized law firms will provide a free initial consultation to help ascertain whether and what sort of legal problem a person may have. (For more information, go to the Law Society.) Whether they will then go on to provide advice without payment, in a case where legal aid or some sort of insurance is not available, usually depends on whether the case is appropriate for a “conditional fee” or “no-win, no-fee” arrangement. Otherwise, the client will be on their own: and if they need to go to court, they will have to act for themselves as a litigant in person. In advising themselves as to the nature and substance of their problem, a litigant in person can also resort to a bookshop, where layman’s guides to various common types of the legal problem seem to be available, or to a library (though these are becoming as rare as hens’ teeth). There used to be a library in the Royal Courts of Justice, in the Queen’s Building, which was open to the public (where law reporters used to assist litigants in person to find relevant books and case law) but this has since been closed. The Inns of Court libraries are not generally open to the public, but the Law Society library in Chancery Lane can be accessed by non-members for a fee of £16 for one day, or £32 for a week. But assuming they can’t find a resolution to their problem and have to go to court, what advice can a litigant in person get on how to do it? Given the rapid increase in the number of expected litigants in person, it is surprising how few books there are to help them. On the Wildy’s (specialist legal bookshop) website there is one, the Litigant in Person Handbook by Ruth Lindley-Glover, which is not apparently scheduled to appear until October 2015. (That may be a mistake as the same book on Hammick’s website is scheduled for October 2014, but it’s still a long way off.) There’s also the more specialised Family Courts Without a Lawyer by Lucy Reed, published in 2011 (£29, or £20.66 on Kindle format e-book). Lucy writes the widely respected Pink Tape blog on family law and I suspect much of her advice would be valuable in other types of litigation. In the last week, however, both the judiciary and the bar have stepped into the breach with publications offering help and guidance to litigants in person. These are pamphlets rather than books and both are downloadable as PDFs. The judicial version comes from the Civil Justice Council and is limited to the type of litigation indicated by its title, A Guide to Bringing and Defending a Small Claim. 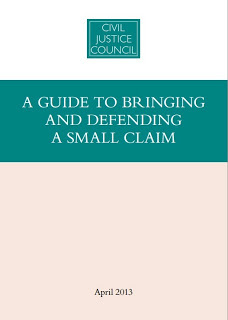 Nevertheless, it provides useful guidance on where to get advice, on deciding whether you really need to claim or defend a claim, web links to forms (such as a claim form), gives examples of a typical claim and how it might be progressed, what sort of evidence will be needed, how to prepare for the hearing, when to speak and how to address the judge, and how to appeal if you don’t like the decision. There’s actually quite a lot of information in its 30 pages, including a two-page “Jargon Buster” containing definitions of technical and legal terms. What one notices immediately about the Bar guide is the standard of production is more glossy than that of the Judiciary’s guide, and indeed it rather resembles a brochure designed to show you the glories of the Bar which, as a poor litigant in person, you won’t sadly be able to afford. On nearly every page there’s a picture of a barrister’s wig or gown or pink-ribboned brief. There’s an unfortunate air of “look what you’re missing out on”, which is a shame because the actual contents are good. Of particular value are the sections on cross-examination and on being cross-examined (probably the most daunting and confusing element for a litigant who is also a witness in his own cause). “Do not use cross-examination to make speeches”, it advises, “don’t argue with the witness” and “speak loudly, slowly and clearly”. There are some other, more specialised guides, such as the Judiciary’s The Interim ApplicationsCourt of the Queen’s Bench Division of the High Court: A guide forself-represented litigants, which came out in January and hasn’t caught up with the latest practice guidance on terminology from Lord Dyson. What all this demonstrates is the perception from those on the shop-floor of the civil justice system that the cost-cutting measures imposed from above, by legislators who in most cases are not lawyers, and with an eye on the economic rather than the social cost, are going to create – for a while at least – a backlog of work and inevitable delays, and it will be to everyone’s benefit if we can help those who have to act for themselves to do so as effectively as possible in the circumstances.